The emergence of objectivity in the mid-nineteenth-century sciences, as revealed through images in scientific atlases--a story of how lofty epistemic ideals fuse with workaday practices. Objectivity has a history, and it is full of surprises. 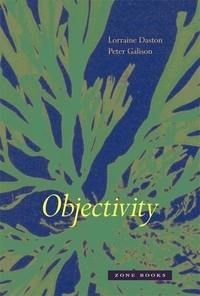 In Objectivity, Lorraine Daston and Peter Galison chart the emergence of objectivity in the mid-nineteenth-century sciences--and show how the concept differs from its alternatives, truth-to-nature and trained judgment. This is a story of lofty epistemic ideals fused with workaday practices in the making of scientific images. From the eighteenth through the early twenty-first centuries, the images that reveal the deepest commitments of the empirical sciences--from anatomy to crystallography--are those featured in scientific atlases, the compendia that teach practitioners what is worth looking at and how to look at it. Galison and Daston use atlas images to uncover a hidden history of scientific objectivity and its rivals. Whether an atlas maker idealizes an image to capture the essentials in the name of truth-to-nature or refuses to erase even the most incidental detail in the name of objectivity or highlights patterns in the name of trained judgment is a decision enforced by an ethos as well as by an epistemology. As Daston and Galison argue, atlases shape the subjects as well as the objects of science. To pursue objectivity--or truth-to-nature or trained judgment--is simultaneously to cultivate a distinctive scientific self wherein knowing and knower converge. Moreover, the very point at which they visibly converge is in the very act of seeing not as a separate individual but as a member of a particular scientific community. Embedded in the atlas image, therefore, are the traces of consequential choices about knowledge, persona, and collective sight. Objectivity is a book addressed to anyone interested in the elusive and crucial notion of objectivity--and in what it means to peer into the world scientifically.